Yesterday the 1296 MHz EME-Project reached a new milestone: After mounting a waterprooved box with preamp and protection relais close to the Septum feed during the past days I tried to listen off the moon for the first time. I asked Dan, HB9Q, if he could transmit some minutes for me with his 10m dish. And so he did. 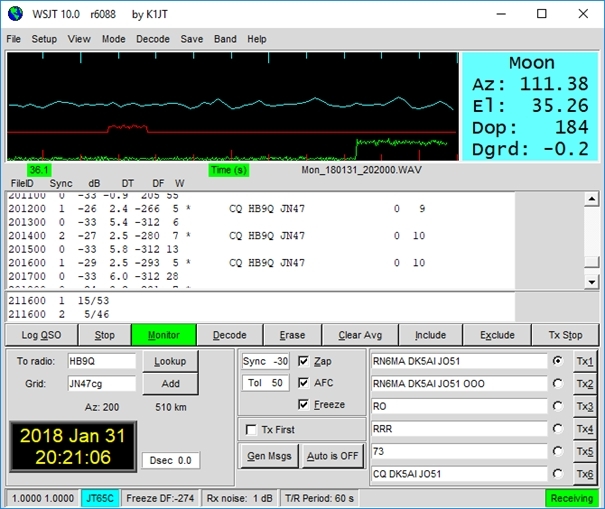 Holding the feed out of the basements window, pointing to the moon and HB9Q was copied easily with -26 dB in JT65c mode. Whow, what a feeling! Now I’m waiting for better weather for further setups. This entry was posted in EME, VUSHF and tagged EME, VUSHF by dk5ai. Bookmark the permalink.